with 110 percent TDG will have an actual exposure of 100 percent. After finding symptoms of gas bubble trauma in 17 percent of Chinook and steelhead below Bonneville Dam on May 15, the U.S. Army Corps of Engineers sent more water through turbines first at McNary Dam, and later at John Day to help reduce spill over the dams, and potential impacts to both juvenile and adult fish migrating up and down the Columbia River. The agency said they will continue to make the operational change when total dissolved gas (TDG) levels are high during times of involuntary spill, expected to continue in the Columbia River through mid-June. Gas bubble trauma in both juvenile and adult fish is caused by high TDG levels--water that's supersaturated with air bubbles--mostly nitrogen, which can be fatal to fish. Spill increases the total dissolved gas in water above its 100 percent saturation level. Water-quality standards in Washington and Oregon limit TDG levels. Those limits vary, but generally range from 110 to 120 percent. By mid-May, with about 70 percent of the Columbia River flowing over spillways, TDG levels below the dams from McNary to Bonneville have ranged from 120 to 143 percent. Ritchie Graves, NOAA Fisheries branch chief for the West Coast Region, told NW Fishletter that TDG levels in the 130s is considered high, and noted that not long ago some biologists were concerned when levels went above 110 percent. He said fish biologists have been concerned about total dissolved gas and gas bubble disease since the 1960s. "As I understand it, when John Day Dam was built, there was a high-flow year shortly after construction, and the full complement of turbines had not been installed," he said. The spill resulted in TDG in the high 130 percent range, he said, which was blamed for significant mortality in adult fish. Total dissolved gas tends to rise at the base of spillways, or natural waterfalls, as extra air is forced into the water. Graves said each spillway has its own signature for how much air it captures, and the amount of TDG in water at the top of the spillway has no correlation to TDG levels at the bottom. However, there is a cumulative effect going downstream, because water going through turbines carries with it TDG levels from water at the top of the dam. Water depth also impacts TDG levels, due to the weight of water pressure counteracting the dissolved gas. Generally, he said, every meter in depth reduces the TDG by about 10 percent, so a fish swimming 1 meter below water with 110 percent TDG will have an actual exposure of 100 percent, he said. He added that fish have no way to detect high TDG levels, so they don't avoid them. Scientists on the Columbia and Snake rivers monitor the impacts by collecting a sample of juvenile fish at most of the dams' bypass systems, with results tracked on the Fish Passage Center's website. Generally, with a sample size of at least 100 fish, action should be taken under voluntary spill situations when 15 percent of juveniles show signs of gas bubble trauma. Although spill is now involuntary at all Columbia River dams, that threshold was met at Bonneville Dam on May 15, when 17 percent of juveniles exhibited symptoms. The dam showed another relatively high reading May 22, with 11 percent of fish with gas bubble trauma. Rock Island Dam has also recorded high levels of trauma since May 15, but sample sizes there have not met the 100 fish criteria. Most recently, 38 juveniles of 88 sampled showed gas bubble trauma. Alene Underwood, Chelan County PUD's fish and wildlife manager, said in an email to NW Fishletter that the high levels of trauma at Rock Island are due to the configuration of the dam's juvenile bypass trap, which collects less than 1 percent of salmon and steelhead passing the dam. When used, it collects fish over a 24-hour period. The juveniles are then held in a relatively shallow trough, where the excess air in a fish's bloodstream can exit and form bubbles in its fins and eyes. These bubbles may not have been present when the fish entered the bypass trap, so higher trauma levels result from holding the fish, which may not have been present in the juveniles that went past the dam, she wrote. She added that gas bubble trauma does not mean a fish will die. Graves noted that the Columbia River Basin's gas-bubble monitoring system is inexact and "pretty coarse," and also varies from dam to dam. But, he added, it can be used to monitor trends. "Overall, when the incidences start getting high, that should be cause for diligence and concern," he said. 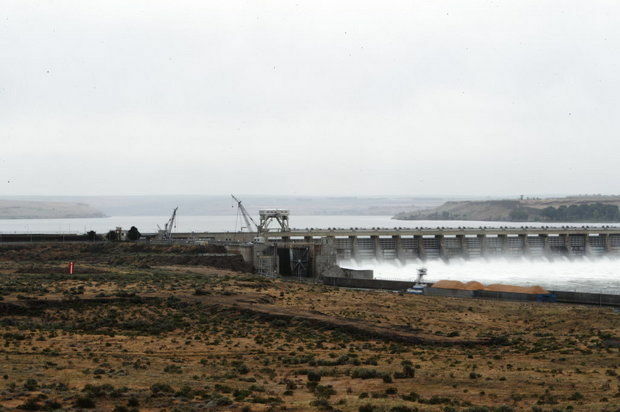 When TDG started to rise in early May, the Corps brought a proposal to increase generation, and thereby reduce spill, at some of its Columbia River dams to the Technical Management Team (TMT). The team is made up of representatives from federal agencies, tribes and state fish agencies who meet weekly to work through issues that come up in the Fish Passage Plan, which specifies operations at eight federal dams on the Columbia and Snake river dams. But after working through the TMT for two weeks on spill reduction plans, the Army Corps determined it has the authority in the Fish Passage Plan to make the spill reductions without permission from the multi-agency technical group. The ability to reduce spill comes from capacity normally held in reserve at a handful of dams in the system in case power generation somewhere else is disrupted. The dams are usually required to operate their turbines within 1 percent of peak efficiency to ensure the least impact to ESA-listed fish, but with TMT consensus, can exceed the peak. One week after adjusting operations at McNary Dam on May 16, Dan Turner of the U.S. Army Corps of Engineers reported to the TMT that river flow for generation jumped from about 113,000 cubic feet per second (cfs) to about 154,000 cfs, enabling the dam to reduce spill by about 36,000 cfs. Total spill at the dam dropped from 371,000 cfs to 335,000 cfs. This resulted in a 2.5 percent reduction in total dissolved gas in McNary's tailwater, which dropped to about 130.2 percent, Turner estimated. Reductions in TDG also occurred downstream, at John Day Dam's forebay. Part of the reduction in spill and dissolved gas levels were the result of two of 14 generating units coming back online at McNary at about the time generation levels were bumped up, he said. Turner noted the operational changes did not trigger any need to operate turbines above the 1 percent peak-efficiency upper limit, as outlined in the fish passage plan. The high gas levels aren't the only issues resulting from this spring's high water. A floating log knocked out a gauge measuring total dissolved gas at Bonneville Dam on May 13, and the water is too high to try to replace it, said Matt Rabe, spokesman for the Corps. He said flooding from rapid snowmelt in areas from eastern Washington to western Montana has provided an abundance of water in the Columbia and Snake rivers, causing constant adjustments at the Corps' projects, which are primarily operating now for flood control. "We are making adjustments to how we store water, and how we release water in an effort to do what we can to minimize flooding in the rivers that flow into the Columbia, and along with the Columbia River itself," he said. The main objective, he added, is to minimize flooding in the Portland and Vancouver areas. Rabe said the runoff brings large amounts of debris, which sometimes pass through the dams without notice, and other times can get hung up, and even damage components of the dams. The biggest focus right now is on safety, he said. While dam operators work around water every day, "the water's moving faster right now. In some places, it's higher, so we do remind folks, there's no such thing as an average day." Taylor Dixon, development and operations hydrologist at the Northwest River Forecast Center, said this amount of runoff is unusual, especially for May. But despite forecasts for a hotter-than-average summer, "At this point, we don't anticipate below-normal runoff." Dixon said it's tough to predict what river levels might be like in late summer, when there are no strong forecasts for precipitation for the next three months. But, he said, although the snow right now is melting fast, and most of the runoff so far has been driven by hot weather and not rain, that won't necessarily mean less water in late summer. "Instead of coming off in a normal fashion, where June would be the high month, it's coming off sooner," he said. "It's an exceptional runoff at the front end." One exception, he said, would be the middle and lower Snake River region, which didn't have a strong snowpack. "With a hot, dry summer, you might expect to see below-normal runoff," he said. But for the Columbia, he said, much of the water will continue to come from above Grand Coulee Dam, where the mountains still hold plenty of snow.